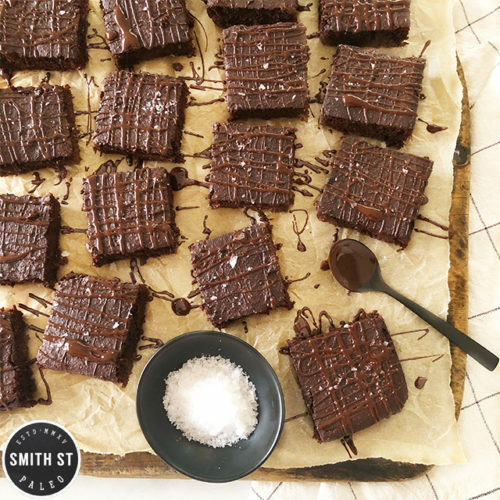 If a brownie was vegan, paleo and gluten-free, what the hell would they talk about first? These guys wouldn’t need to be THAT annoying brownie, their deliciousness would speak for itself and all their brownie friends wouldn’t get pissed off at their preachy, self-righteous, morally superior attitude and still invite them over for wine night. Please note that this is a totally made up story (maybe), and not a thinly-veiled reflection of a real life scenario (probably). Peel, chop and steam your pumpkin if using fresh pumpkin. Grease and line a 20cm square baking tin with baking paper. Put the ground flaxseed in a small bowl with 1/2 cup hot water and set aside for 10 minutes. Chop the chocolate roughly and place in a heatproof bowl with the coconut sugar and almond milk and place over a saucepan of simmering water until melted, smooth and well combined. Put the dry ingredients into bowl of your food processor and pulse together to combine. Add your cooked pumpkin and soaked flaxseed, including the soaking water, and pulse again. Scrape down the sides of the bowl, then add in the chocolate mixture. Whizz together to a smooth, creamy consistency. You made need to scrape down the sides once or twice. (Note: if you don’t have a food processor you can clearly make this mixture in a bowl, you’ll just have to puree the pumpkin to smooth before adding). Spoon mixture into the prepared tin, pushing mixture to the corners and making it level. Bake for 1 hour. Remove from oven and let cool in tin, before removing and cutting into squares. These are good stored in the fridge as they go fudgy and dense. – If you’re using fresh pumpkin, I used butternut. It will lose some weight in the cooking process, so I steam about 450-500g raw pumpkin to get 400g cooked. You could also use tinned pumpkin puree. Sweet potato would also work, same deal with the weight loss in cooking. – I used a Paleo & Vegan compliant 67% cacao chocolate. It was a brand called ‘So Free’.